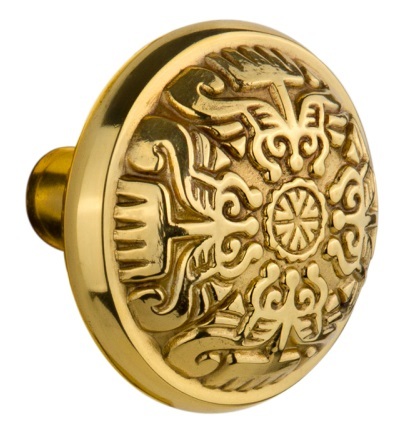 Bring the highest of quality door hardware products into your home by purchasing this pair of forged brass knobs from Nostalgic Warehouse. Designed to give you an antique design, their quality is easy to find as they are mounted on solid, forged brass bases, not brass plated. If you are participating in a renovation of a historic home, these doorknobs may be the perfect match for your decor. IMPORTANT INFO YOU NEED TO KNOW! - These antique knobsets are sold as KNOBS ONLY with a spindle! Other hardware (latches, strike plates, etc.) not included with these knobsets. This type of vintage door hardware is most often used when you have an older home that needs replacement knobs but not necessarily all new components. These knobs are meant to replace your old existing knobs that use the spindle and set screw design, but we do not guarantee they will fit as there are many brands of hardware that each have their own design. Please take measurements of your existing antique hardware to make sure you order the right size spindle. Nostalgic Warehouse Antique hardware is subject to a 20% restock fee. - Knob Diameter - 2-1/4"
- Knob Projection - 2.04"
- All knobs are sold in pairs (2 knobs) and include the spindle type you select. You can choose which kind of spindle you need. 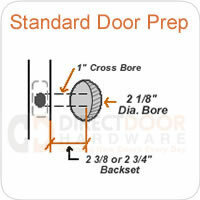 Whether you have a vintage Mortise Lock, or a standard Passage or Privacy or a Dummy knob. We have a spindle that should work for you. For more details call us at 307-886-9449.